About one in every 100 children has a heart problem, which may also be called a heart defect or congenital (present from birth) heart disease, said a senior consultant paediatric cardiac surgeon of Apollo Children’s Hospital, Chennai, India. Doctors at Apollo Hospital in India performed a rare surgery for a 12-year-old girl suffering from a rare heart condition, offering her a fresh lease of life, added Dr Neville Solomon. The case presented huge challenges at every step, as the girl was diagnosed with total anomalous systemic venous connection – where all the systemic veins were abnormally connected to the atrium that drained into the left ventricle. It is a rare congenital cardiac malformation with diverse consequences and surgical correction is the treatment of choice. At surgery atrial septation has to be done in such a manner that, systemic venous return is redirected to the right atrium and pulmonary venous drainage is retained in the left atrium. Apollo Hospital performed this rare surgery successfully, which has been done less than 50 times all over the world so far. “The 12-year-old girl suffered from a rare complication. She was poor-weight, was short on breath and displayed bluish discolouration of skin and nails, poor growth and fatigue. As soon as we saw her, we realised that this requires an early paediatric cardiac surgery. After consultation with parents, we suggested the surgery, which was a major success,” said Dr Solomon. Most congenital heart defects result from problems early in the child's heart development, the cause of which is unknown. However, certain environmental and genetic risk factors may play a role including medications, diabetes and hereditary conditions. It is believed that complicated heart problems in children can lead to heart failure, slow growth of the child, stroke and also emotional issues. “Most times, the cause of congenital heart defects is unknown. However, certain tests as chest x-rays, an electrocardiogram (ECG) and ultrasound scan (an echocardiogram, or an echo) can help assess a condition. If parents observe something uncommon, they should see a doctor to avoid the risk of heart problems in children,” added Dr Solomon. Equipped with all the advanced facilities to perform intervention and surgeries to even very small neonate(less than 5 kg), Apollo Hospitals has some of the advanced facilities including a state-of-the-art Cath lab and operating room exclusively dedicated to paediatric cardiology/ cardiac surgery. 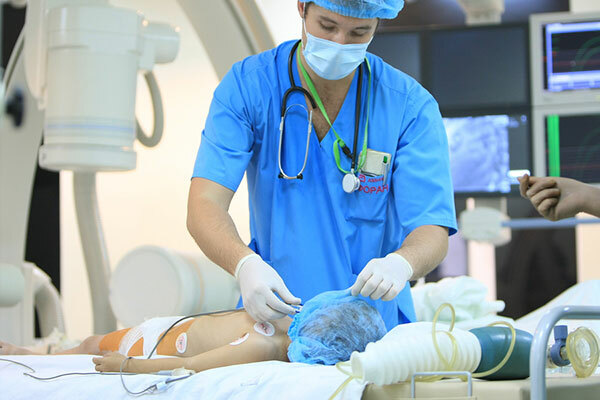 In addition, the hospital also has a corporeal membrane oxygenator (ECMO) support, advanced ventilators and equipment needed to support the children who undergo complex surgeries. According to Centers for Disease Control and Prevention, heart diseases are responsible for an astounding one in four deaths. While adults make up the largest number of people with cardiovascular disease (the umbrella term for conditions of the heart and blood vessels), young people are affected, too. The team at Apollo Children's Hospital, Chennai has an extensive track round in dealing with complex cases. Sixty per cent of the surgeries are for babies 5 kg or less than one year of age. The smallest successful arterial switch operation (a very complex surgery) they have done is on a newborn baby weighing only 1.6 kg; the earliest surgery on a baby just five hours old having obstructive Infracardiac total anomalous pulmonary venous drainage (another complex congenital heart condition).